Tonight I baked an experimental / trial batch of cookies for an upcoming beer. Yup, a batch of cookies for a batch of beer. 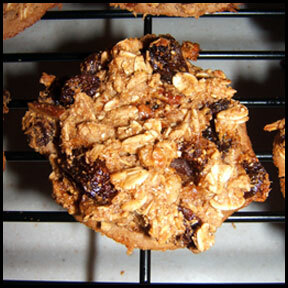 For a while now I have had the idea of an Oatmeal Cookie Stout stuck in my head. All the creamy love of an Oatmeal Stout but with some of the characteristics of an oatmeal cookie: toasty, chewy, raisiny, cinnamony, a touch of vanilla – you know. So originally I was just going to add the flavorings to the boil or fermenter or something, but I wanted that baked cookie flavor. So I thought for a while about toasting the oatmeal before the mash, and just recently I thought why not mash with cookies! 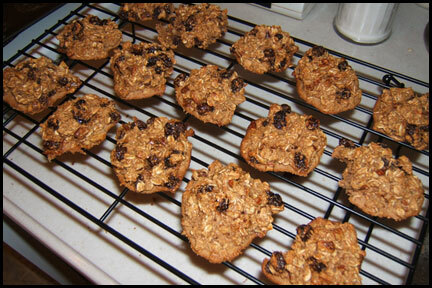 So that’s what I am going to do, mash oatmeal cookies – I know I am begging for a stuck mash! Anyway, I’m going to keep my base Oatmeal Stout recipe the same and then mash in additionally about 30 oatmeal raisin pecan cookies. The reason I did the trial run tonight was because I had to modify the cookie recipe to take out all the milk and oils/fats – I only wanted to use things that I was OK putting into my beer. The funny thing is I am not really sure how to compensate for the extra sugars and oatmeal stickiness in the mash, maybe just some extra hot water – I’ll figure all that out later, right? I thought the cookies turned out pretty well, will definitely try them warmed up in the microwave for breakfast this week. We’ll see how they hold up. I’ll let you know how the stout turns out, whenever that is! This entry was posted on Monday, June 15th, 2009 at 10:53 pm	and is filed under Homebrew. You can follow any responses to this entry through the RSS 2.0 feed. You can leave a response, or trackback from your own site.